So, I am feeling a little exhausted…despite a mini vacation with grandma/grandpa/aunt, the baby has still decided she is firmly anti-sleep. I wanted to post a recipe for gluten free empanadas today, but when the time came for a third grocery trip (previous trips having been cut short due to Howling Baby), I just simply couldn’t do it. So, I took the chicken and said EASY CHICKEN SANDWICHES FOR ALL!!!!! It’s copied a bit from the testing geniuses at America’s Test Kitchen, but also adapted cause I had no lemons, less money, and a small NYC apartment that definitely has no grill. But I wanted not-dry, flavorful chicken dammit, and so I kind of threw things together and just crossed my fingers. Also, yellow and orange bell peppers have been on SAAALE for 99/lb, and so yeah I roasted up a bunch cause they are just so delicious. So get those going first, then marinade your chicken, and while all that’s going on, wash your greens, salt your tomatoes, and make the dressing. Half hour to a solid, solid dinner. First off. 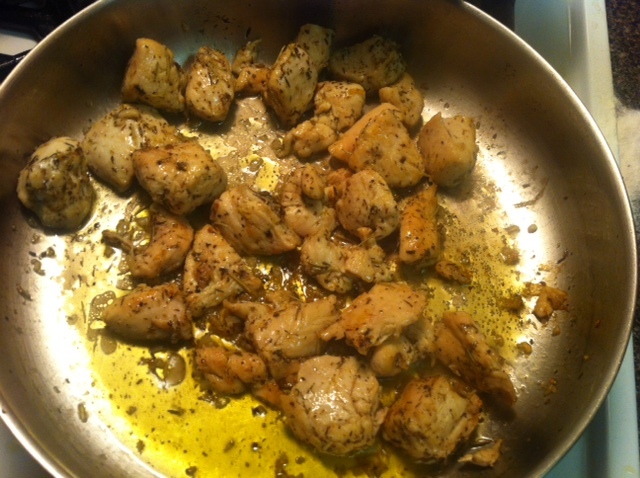 Make your marinade- that’s the oil, garlic, s&p, and spices. Set aside two tablespoons of this mix into a separate bowl, as it will be the base for your dressing. Take a fork, and poke holes all over the chicken breast, both sides. Then cube them up into reasonably bite sized pieces. Put the chicken into the marinade, cover with plastic, and let sit for about half an hour. In the meantime get your other components ready, which includes finishing the dressing. For the dressing, whisk the mayo into the set-aside oil, slowly add the vinegar, and finally add the red onion. After your half hour’s up, pour some of the marinade into a pan with a cover and get it hot but not smoking. 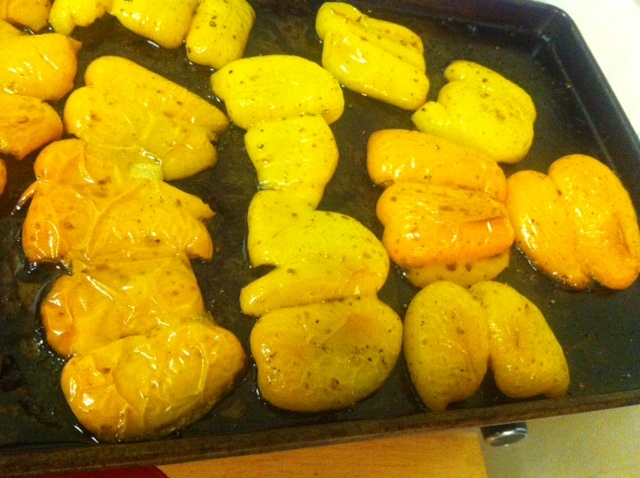 Add the chicken pieces, and quickly turn them so all sides get lightly cooked. Here’s the tricky part- at this point you have a LOT of oil, so pour most of it out, while keeping the chicken in the pan. Turn the heat down to low, and cover. Leave it for about 4-5 minutes, and check a few pieces to make sure they are cooked through. Rare steak might be a good thing, but rare chicken is certainly not. 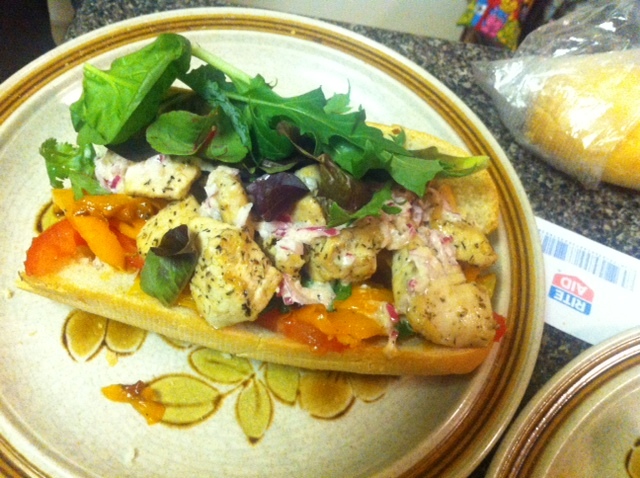 Build the sandwiches- roasted peppers first, then the tomato, then the chicken, topped with dressing. Top with the cilantro and mixed greens. Hooray, dinner has been conquered! Thank goodness. Now sit back, kick up your heels, and dig in.